University can be a daunting place: being away from home, making new friends and academic pressures can all take their toll. And for anyone coping with mental health problems, it can be even harder. Now thousands of students have joined a scheme that allows staff to tell parents or guardians if they are struggling. The University of Bristol has introduced the scheme after 11 students took their own lives since 2016. "Coming to university is such a challenging time and it's a big transition, many students are still very young." Hester is a third year Politics and Economics undergraduate student at Bristol University. She's also Chair of the Wellbeing Network at Bristol Students' Union. She told Newsbeat she would be happy for the university to contact her parents. "I was in a position when I started university and had to drop out five years ago. My parents weren't contacted because they didn't have their details. I was in a really bad place physically with my health and I ended up in hospital," Hester says. Ben Murray, 19, died in May. He was the 10th Bristol student to take their life in the last two years. Ben had been falling behind with his university work but his parents didn't know. His father James Murray has been campaigning for the rules to be relaxed so parents can be told if students are struggling. He told Newsbeat: "When I met Ben on the day that he took his own life, he was four days away from being removed from halls and had already gone through the withdrawal process to remove him from university and I didn't know anything about that. "The overwhelming feeling I have is that had I known what was going on in his life at university, we could have done something and Ben would still be with us today. I believe that information sharing would have helped," says James. Bethany is a PhD student in her third year at Bristol, studying aerospace engineering and cellular and molecular medicine. In her first year, she slipped and fell down a flight of stairs. She spent 16 weeks in a spinal brace and, a few months after the fall, she was diagnosed with clinical depression. "I got PTSD (Post Traumatic Stress Disorder) coming back onto campus, because that's where I'd hurt myself. Having to take time out physically really had an impact on me mentally," Bethany told Newsbeat. 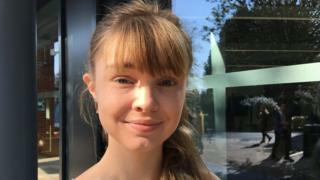 The 25 year-old started seeing a counsellor at university and took part in the Healthy Minds programme, which uses physical exercise to reduce stress and anxiety. Now she plays in the women's rugby team as a  scrum forward. Bethany says: "Find a group of people that are your people. Try and join different societies and just try lots of different things. You'll find the crowd that you can run with." For any students who might be struggling, James Murray's advice is: "Don't tough it out. Troubling thoughts, which can be suicidal, will pass if you get the right support so please do go and visit the wellbeing people, they're there to help."